What Would a Moral Israel Look Like? Filed under: World View, The "Dunya"
What would a moral Israel look like? Could there be an Israel that would gain the love and respect of the world? Could Israel, for instance, redeem itself as South Africa has? Yes, it could. The answer will seem naïve to some. What has been described as a complex and intractable situation, really, is not. Until now, we have unfortunately seen only evidence of the opposite, and the whole situation is stuck in a never-ending cycle of violence. Israel is a country founded upon religion, and religion, whatever people may say, is fundamentally about morality. Israel’s morality is, unfortunately, self-evident. No religion advocates killing, especially the killing of innocent people. It is fair to say that the people of Gaza are living in an open-air concentration camp, being denied the most basic economic freedoms and human rights, suffering every day from brutal and humiliating oppression. Their agricultural lands have been appropriated, their water resources have been curtailed. All of this information and history is easily available. See, for instance, a website like http://www.ifamericansknew.org which attempts to inform Americans about the conditions in the occupied territories. This site also offers the best history of this problem that I know of: http://www.ifamericansknew.org/history/origin.html which was written by Jews for Justice in Palestine. What allows injustices of this type to be perpetuated is the distortion of information and the telling of outright lies. The worst crimes against humanity are typically justified by focusing on a few links in the chain of events. The current and recent attacks on Gaza are excellent examples of a justifying narrative that goes something like this: Israel must defend itself against rockets launched by militants in Gaza. These rockets are being launched by people who wish to destroy Israel itself. As President Obama says, any country has the right to defend itself from attack. But what is left out of that selective version of the story is the long history that began with the creation of the Zionist state of Israel, the destruction of hundreds of Palestinian towns, the millions of refugees, and the cruel Palestinian occupation. As Juan Cole wrote recently in “Is Rula Jebreal Right About U.S. Media Bias Against Palestinians?” Posted on Jul 22, 2014: From most American media you would assume that the Israelis were minding their own business and the Palestinians of Gaza just irrationally started firing rockets at them. With rare exceptions, we aren’t told that most truces have been broken by Israel, not Hamas. We aren’t told that over 70% of Gaza’s population used to live in Israel and was ethnically cleansed and left penniless. We aren’t told that Israel has a blockade on Gaza that does not allow it to export most of what it produces, that this blockade has thrown 40% of the working population into unemployment and left 56% of families food insecurity (just on the verge of going to bed hungry). We aren’t told that Israeli occupation has left 90% of people in Gaza without potable water. We aren’t told that Gaza’s Palestinians demand an end to being kept in a big concentration camp. If Israelis were being treated as the Palestinians are, what do you think they would do about it? 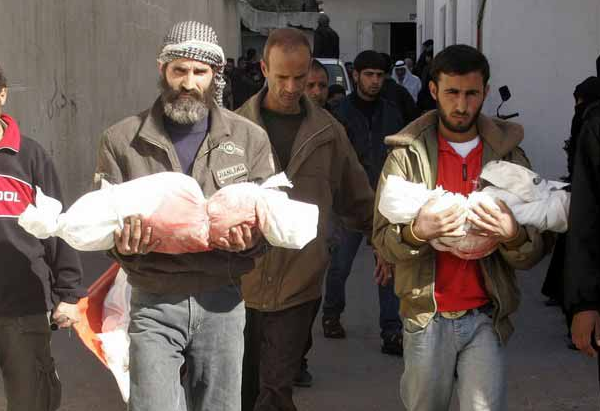 And every few years, Israel flexes its military muscle with a new bombing campaign killing thousands of defenseless civilians under the pretext of eliminating militants, while our leaders lament these unfortunate deaths and yet remain complicit by supplying Israel with weapons and money. It was after this that some militants began to launch rockets into Israel. And while Israel continues its hugely disproportionate attack on Gaza, other events which could be major stories are not even noticed by most of the media, such as this from Saturday, July 19, 2014 02:20 by Celine Hagbard – IMEMC News: 110 Palestinians, including a number of elderly men and women, were treated for injuries after Israeli troops attacked worshipers at the Al-Aqsa Mosque in Jerusalem. The wounded include two Directors of the Board for Islamic Endowments, several journalists, and paramedics who arrived on the scene to treat the wounded. America, especially, is routinely fed misinformation about Israel and Palestine. This week, former Rep. Jane Harmon (D. CA) said on Real Time with Bill Maher that the Hamas Charter calls for the death of every Israeli, including women and children. I decided to check this out for myself and read the Hamas charter for the first time. I could not, however, find any such proposal. Hamas, admittedly the most extreme Palestinian party, does take the position that the state of Israel must be replaced with an Islamic state. Hamas is basically advocating an Islamic equivalent of Zionism. If any of the above seems extreme, these are the words of people who are suffering extreme deprivation, who have lost most of their original homeland, and who feel they are in danger of losing everything. Yes, there may be a militant minority on both sides that call for the destruction of the other, but if the population of Palestine as a whole were not being provoked, the vast majority of Palestinians would embrace an opportunity to live in peace, and these militant minorities would dwindle into insignificance. The Jewish people could then begin to live by the morals of the Torah and use their exceptional intelligence for the benefit of humanity. I would suggest that our brothers and sisters in Israel awaken a little bit of courage and a lot of generosity. I would argue that Israel’s survival is not enhanced by the strategies it now uses—quite the contrary. The world abhors these measures. Our planet is in crisis. Make peace with the Palestinians and with humanity so that we can begin to face our common problems together. Wonderful essay. If all Americans could read and understand this we might be able to force the Israeli government to do the right thing. Please help circulate this article which was turned down by The Huffington Post – written by Shaikh Kabir Helminski, a regular blogger of the HP. It seems that the HP’s huffing- is very censored and very one-sided!